The U.N. World Intellectual Property Organization's Standing Committee on Copyright and Related Rights Committee meets this week to discuss the latest redraft of the contentious new Broadcasting Treaty. The treaty would give broadcasters, cablecasters, and potentially webcasters, broad new 50 year rights to control transmissions over the Internet, irrespective of the copyright status of the transmitted material. It also requires countries to provide legal protection for broadcaster technological protection measures that will require Broadcast Flag-like technology mandates. On April 20, EFF Staff Attorney Kurt Opsahl argued the critical issues in Apple v. Does before a San Jose, California appeals court, telling a panel of three judges that denying confidential source protection to journalists -- whether online or offline -- would deliver a dangerous blow to all media. The judges hearing the arguments asked tough questions and seemed to understand the high stakes for free speech in this case, and we are looking forward to their decision. On May 5, the DC Circuit Court of Appeals will hear oral arguments in a suit brought by EFF and a coalition of public interest, industry, and academic groups challenging the FCC's unjustified expansion of the Communications Assistance for Law Enforcement Act (CALEA). By forcing broadband Internet and interconnected voice over Internet Protocol (VoIP) services to become wiretap-friendly, the FCC ignored CALEA's plain language and threatened privacy, security, and innovation. Last week, we urged you to sign our petition to Congress opposing the RIAA lawsuits, and now we need another push to reach our goal of 100,000 signatures. The story so far: the broadcast flags, both video and audio, have been wandering the halls of Congress, looking to smuggle themselves into law, like tramps looking for an empty boxcar. For nearly a year, neither the MPAA and RIAA have been able to find them a ride. The MPAA failed to introduce the broadcast flag language into an appropriations bill, or the reconciliation bill, nor could they sneak it into last year's urgent digital television transition bills. The RIAA's audio flag has been rebuffed at every turn. But early this week, Senator Ted Stevens (R-AK) introduced a long awaited 125-page draft reform of the Communications Act to the Senate Commerce Committee last week, and both flags found their lift. With telecom reform likely, it's critical that you take action now to stop these dangerous proposals from coming along for the ride. The meeting of the WIPO Standing Committee on Copyright and Related Rights on the new Broadcasting/ Webcasting Treaty has just concluded and there's some welcome news for those of us in the Internet Community. Webcasting - which was in the current draft of the treaty as an opt-in Annex - is now going to be removed from the main treaty draft, and put into a new proposal of its own, which will be discussed at a separate meeting, and proceed on a parallel slower track. Efforts to finalize a treaty focusing on broadcasting and cablecasting in the "traditional" sense will continue on a faster track. The Chair will create a new treaty draft by August 1, which will be finalized at one further meeting of the Standing Committee. Then a recommendation will be put to the WIPO General Assembly in September to convene an early 2007 Diplomatic Conference on the "traditional" Broadcasting Treaty. (See below for the Chair's summary of the new two-track process). 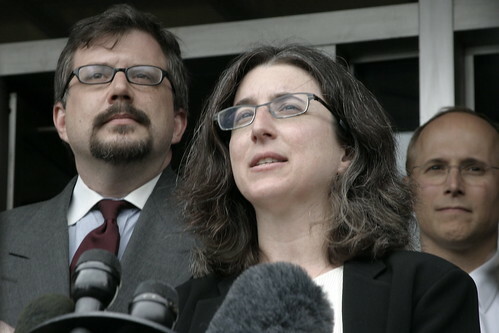 Court Calls FCC CALEA Ruling "Gobbledygook ... Utter Nonsense"
Today, the DC Circuit Court of Appeals heard oral arguments in a suit brought by EFF and a coalition of public interest, industry, and academic groups challenging the FCC's unjustified expansion of the Communications Assistance for Law Enforcement Act (CALEA). The suit argues that the FCC ignored the plain language of CALEA by forcing broadband and VoIP providers to become wiretap-friendly. "'This is wholly ridiculous,' [Judge Harry] Edwards said, saying that Congress' meaning was clear. The FCC's argument 'is such gobbedlygook, it's really funny.... It's utter nonsense.'" "If the expert was right, this stub would enable me to access Broer's personal information, including his passport number, date of birth and nationality. It would provide the building blocks for stealing his identity, ruining his future travel plans - and even allow me to fake his passport. This month, Wired published a chilling article by (former EFF Media Coordinator) Annalee Newitz about RFIDs and the privacy threats they create. She tells five stories of these chips in action and how simple hacks can expose you to identity theft, stalking, and tracking. Anyone could uncover your reading habits by exploiting chips embedded in library books, while RFIDs in US passports could blab your personal information to strangers. Newitz even has an implantable RFID -- intended for use in "medical ID tags and ... secure-access keys" -- embedded under her skin in order to illustrate its lackluster security. Today's USA Today confirms that the "National Security Agency has been secretly collecting the phone call records of tens of millions of Americans, using data provided by AT&T, Verizon and BellSouth." According to the report, "With access to records of billions of domestic calls, the NSA has gained a secret window into the communications habits of millions of Americans." As the Q&A explains, "The call-collecting program is focused on domestic calls, those that originate and terminate within U.S. borders." However, one company apparently stood up to the NSA's request -- Qwest. Today the Progress & Freedom Foundation (PFF), a DC-based "market-oriented think tank that studies the digital revolution and its implications for public policy," released a report entitled "The DMCA Dialectic: Towards Constructive Criticism." In the report, PFF Senior Adjunct Fellow Solveig Singleton argues that DRM, and laws to stand behind it, are necessary because "somehow, one needs boundaries to exclude free riders. Not all free riders, but enough to have a critical mass of paying customers." Early Saturday morning, in the darkest hours of the night, the Department of Justice made good its threat to file a motion to dismiss our class-action lawsuit against AT&T, contending that AT&T's collaboration with the NSA's massive and illegal program to wiretap and data-mine Americans' communications (which violates the law and the privacy of its customers)--despite being front page news throughout the United States and the subject of government press conferences and Congressional hearings--is a state secret. The motion was accompanied by declarations by Lieutenant General Keith B. Last year, Online Rights Canada (ORC) launched with the joint support of EFF and the Canadian Internet Policy & Public Interest Clinic (CIPPIC). ORC represents the public interest in critical technology and information policy issues. If you live in Canada, now you can make your voice heard through ORC's brand new Action Center. Even if you don't, spread the word to your friends up north. Editor and Publisher has published an informative critique of the Washington Post's early poll in the wake of USA Today's report last week that three major telcos have violated the privacy of millions of ordinary Americans as part of the National Security Agency's (NSA's) spying program. Calling the Post's poll "highly misleading," Editor and Publisher cites two contrary polls showing that a majority of Americans oppose the spying. News hit today that the U.S. Supreme Court has reversed a lower court decision to issue an injunction against eBay for infringing a patent owned by MercExchange on the "Buy Now" feature associated with auction services. EFF filed an amicus brief [PDF] on eBay's behalf. While the decision primarily concerns itself with the proper test for injunctions, one of the concurrences previews four Justices' ideas on the controversial topics of patent trolls and business method patents. Congress to demand action over the NSA's domestic surveillance program. investigation, and to refuse to rubber-stamp these illegal projects. It takes just a few minutes to let your representatives know how you feel and add to the growing chorus of complaints about this illegal action. As has been widely reported, the four major record labels have filed a copyright infringement suit against XM Radio, based on the recording capabilities included in certain recently-introduced XM receivers, such as the Pioneer Inno and Samsung Helix. This morning we had the first court hearing in EFF's class-action lawsuit against AT&T. Over AT&T's objection, the court refrained from closing the courtroom and denied AT&T's bid to force us to return the AT&T documents supporting our Motion for a Preliminary Injunction. While keeping the documents under seal for the time being, the court set forth a process for redacting some of them to become available to the public. In addition, the court set a briefing schedule to allow the case to move forward quickly. We look forward to continuing the fight against AT&T's efforts to violate the law by collaborating with the NSA's massive and illegal program to wiretap and data-mine Americans' communications. There is a new anti-DRM campaign being started by the Free Software Foundation, and they are organizing a launch event in Seattle for tomorrow. They are looking for supporters to join them, and ask that if you can be in the downtown Seattle area from 8:00am on Tuesday May 23, sparing an hour or so before work, that you should contact them at action@defectivebydesign.org (please include a contact phone number). Details of the launch event will be sent out before hand. With so many tech mandate proposals and DRM restrictions being introduced, it's all too easy to miss how they fit together. A digital radio mandate here, an analog hole plug there, add in a little HDCP on video outputs for bad measure, and so on -- pretty soon, you've got DRM everywhere, and the whole is far more dangerous than the sum of its parts. EFF is fighting DRM wherever it rears its ugly head, and our new page, The Battle for Your Digital Media Devices, introduces the major fronts. We've also launched a page about digital video, describing the alphabet soup of restrictions that Hollywood wants injected into your devices. We've had many requests recently for an audio summary of EFF news. While we thought that dictating all the motions and filings, press releases, newsletters and blog postings that we file every month might make for an exciting six hour commute, audience research indicated that might be a little ... overstimulating. So instead we present Line Noise, a super-compressed, five minute audio summary of the current hot topics at EFF. In today's Star Tribune, renowned computer security expert Bruce Schneier explains in plain language why the NSA spying program is a remarkably ineffective way to identify potential threats. He hypothesizes an "unrealistically accurate system" for data mining personal information and demonstrates that it would generate billions of false alarms and millions of false leads. As many news reports have stated, the real world NSA spying program has performed predictably poorly. Americans can and should be safe and free, and they certainly shouldn't have to trade away their privacy without any benefit. Support EFF and help stop the illegal spying.